A coordinating bra and suspender set in chantilly lace lined with nylon. 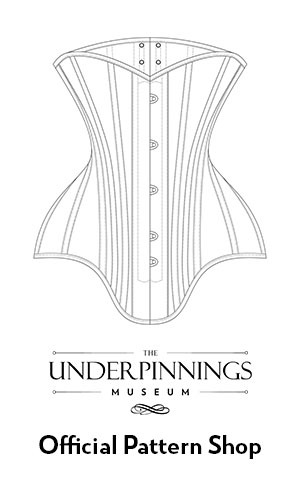 The garment silhouettes are inspired by mid-20th century foundationwear: the bra gives a lightly pointed bust shape and the suspender offers full and fitted coverage (with only a small strip of elastic in the centre back offering a little fit flexibility). The bra features ribbon appliqué across the cup in the shape of a bow, an embellishment technique that has been used since the 19th century, but was most famously popularised by the Bali company with their bow bra range in the 1950s. Dottie’s Delights’ designs often take inspiration from vintage fashions, replicating not just the aesthetics but also the fit and function. The ‘Bricolage’ range was part of the brand’s third season (Autumn/Winter 2012), which according to the brand’s founder, was ‘the hardest in terms of cash flow as a brand new business’: the range’s name ‘Bricolage’ translates from French as ‘DIY’ and was a reference to making the best of limited resources, and the blending of historical influences from different time periods. Dottie’s Delights was founded in 2010 by Stephanie Kuhr in Chicago. She was one of 6 designers in residence at the Chicago Fashion Incubator programme that year, a not-for-profit program supported by the City of Chicago and Macy’s which assists designers in building and launching fashion businesses. Since its launch, the brand has been featured in numerous fashion publications, has been worn in major period TV dramas and worn by a number of celebrities. In 2015 the brand relocated to Nashville, Texas.